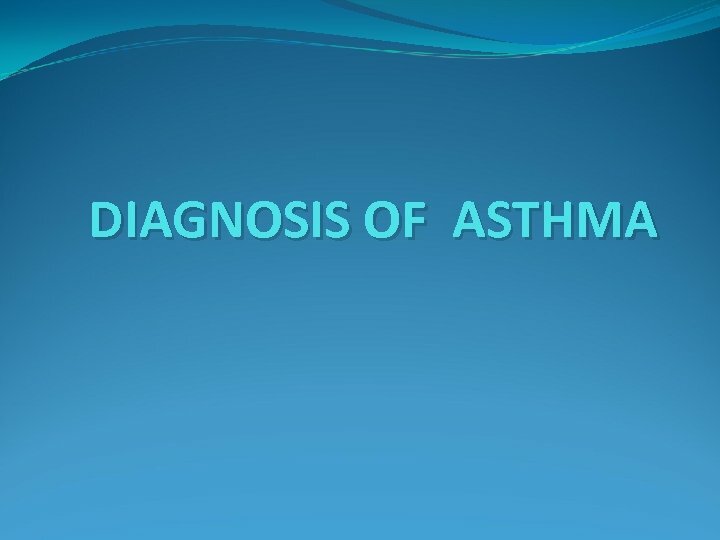 Asthma is a chronic inflammatory disease of airways that is characterized by increased responsiveness of the tracheobronchial tree to a multiplicity of stimuli. 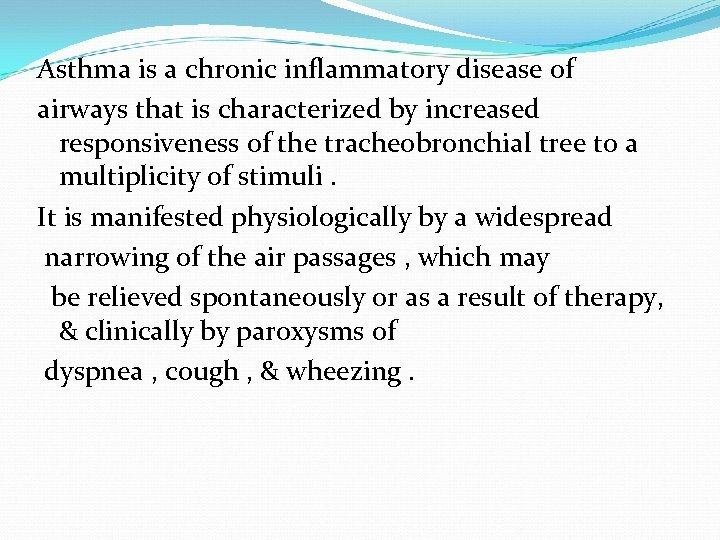 It is manifested physiologically by a widespread narrowing of the air passages , which may be relieved spontaneously or as a result of therapy, & clinically by paroxysms of dyspnea , cough , & wheezing. 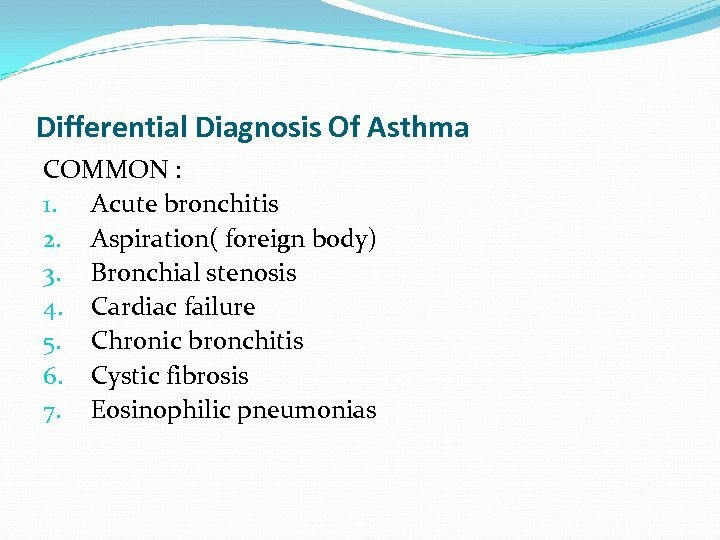 Prevalence of Asthma is a very common disease. 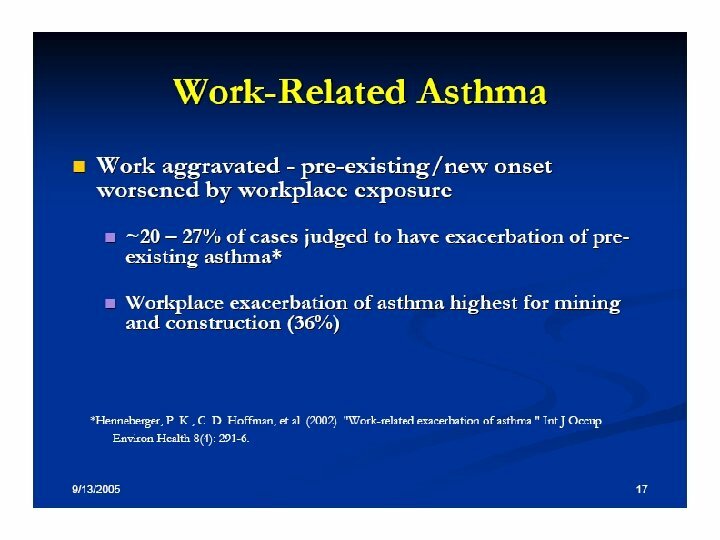 Current estimates suggest that 300 millions people world-wide suffer from asthma & additional 100 millions may be diagnosed with asthma by 2025. The prevalence of asthma is rising in many parts of the world e. g. in US the prevalence increased from 4 -5% to ~ 10 -12% of adult & 15% of children. 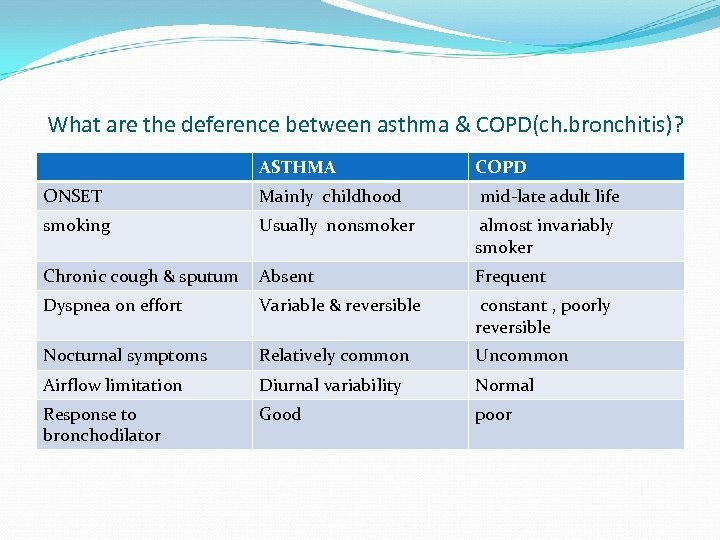 The prevalence of asthma in UK ~ 7% in adults. There is no study to estimate the real prevalence in IRAQ !! Prevalence ( cont. 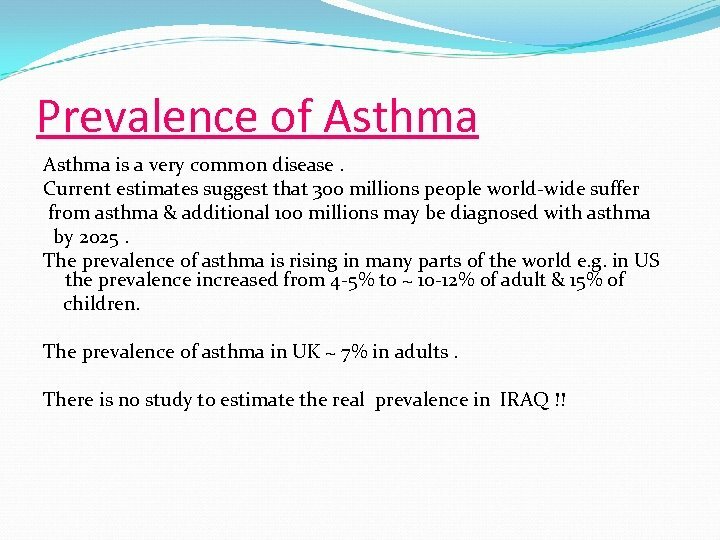 ): The mean prevalence of asthma in Middle East is about 5. 8%. In Kuwait 8. 5% ; Iran 5. 5% ; Turkey 7. 4% ; Saudi Arabia 5. 6%. Asthma more common in children , about One –half of cases develop before age 10. Another 1 3 occur before 40. 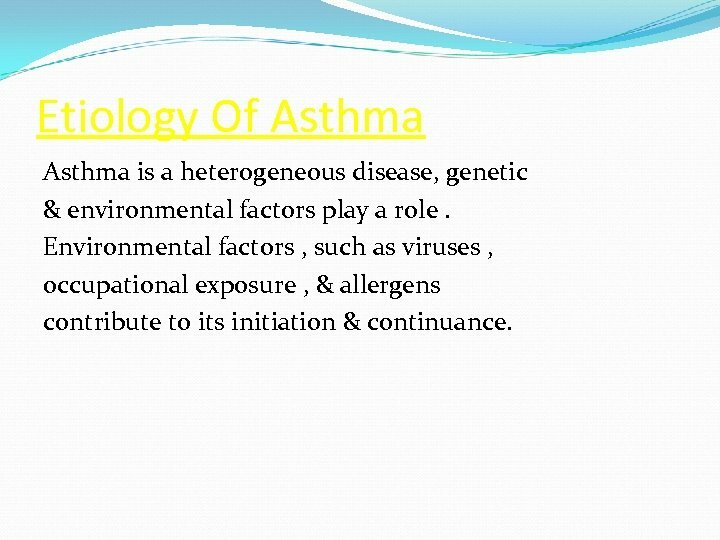 Etiology Of Asthma is a heterogeneous disease, genetic & environmental factors play a role. 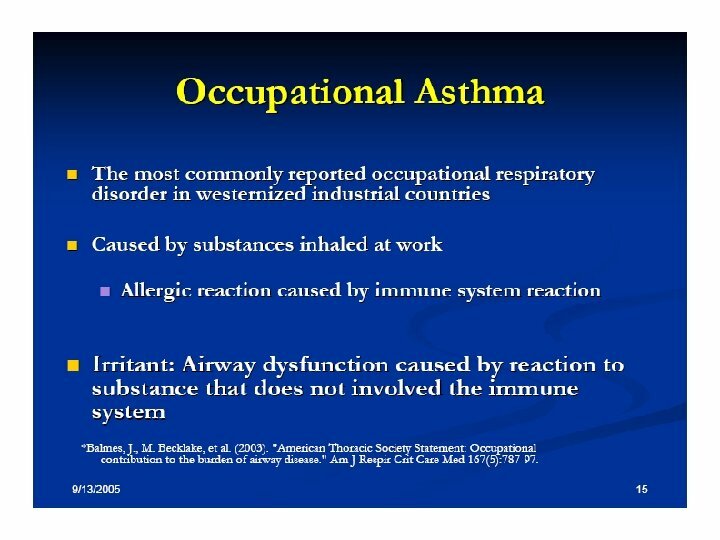 Environmental factors , such as viruses , occupational exposure , & allergens contribute to its initiation & continuance. 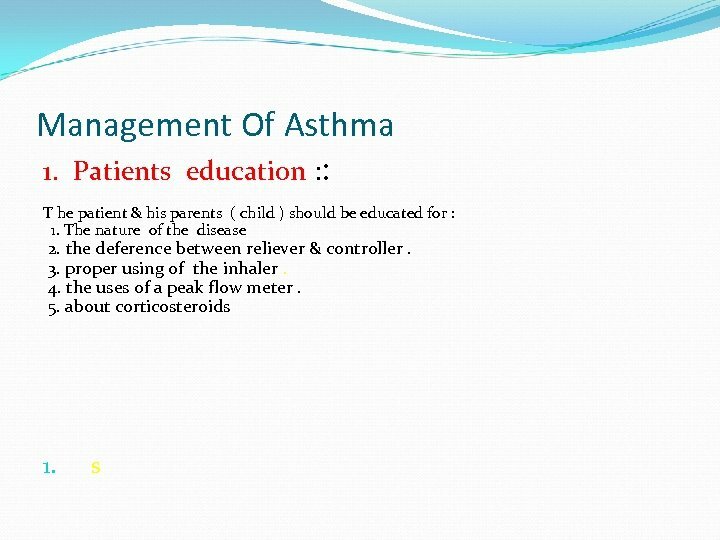 Classification Of Asthma 1. 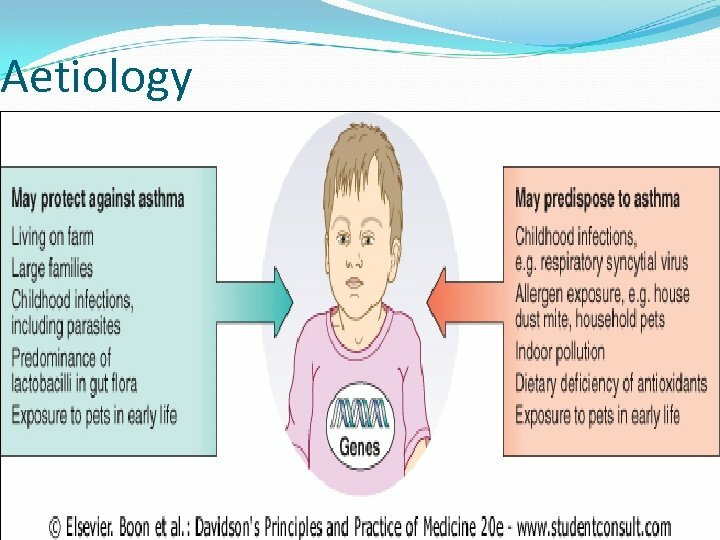 Allergic asthma ( atopic)( extrinsic) It is often associated with a personal ∨ family history of allergic disease + increased level of Ig. E in serum & or positive response to provocation test. It is usually early –onset & typically episodic. 2. 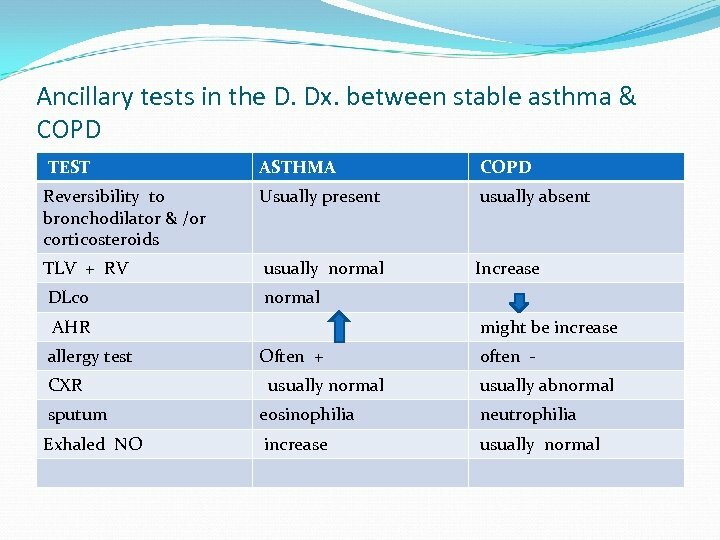 Idiosyncratic asthma (non- atopic ) (intrinsic): 3. 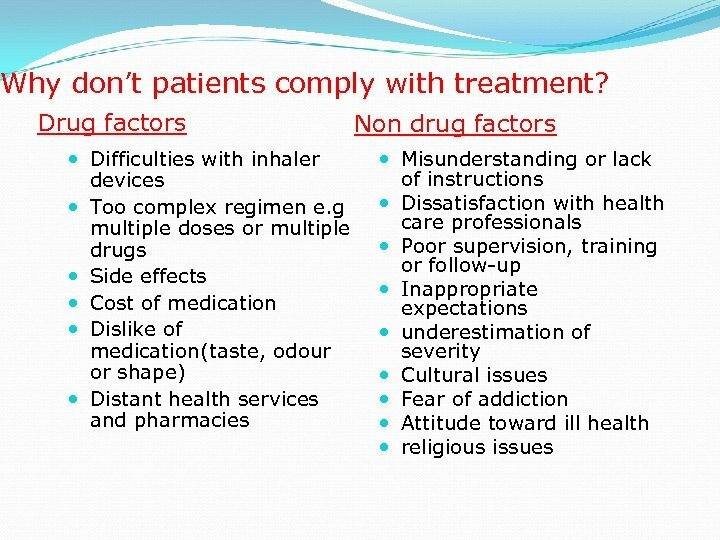 Many patients have disease not fit clearly into either of the above ( mixed group). 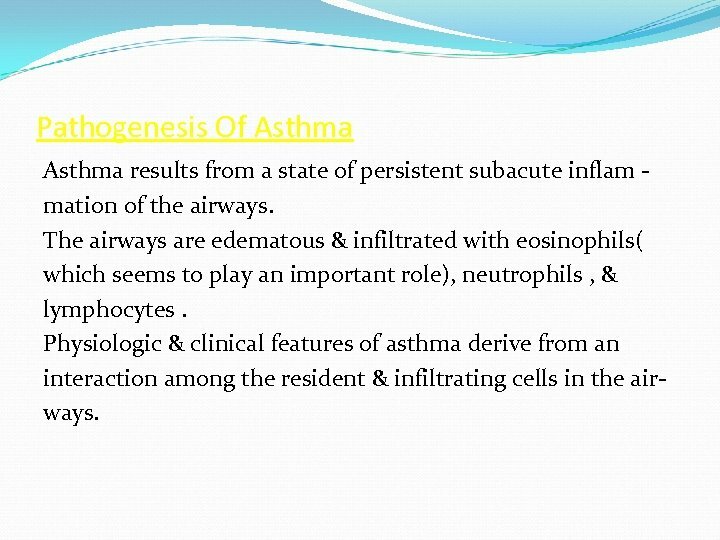 Pathogenesis Of Asthma results from a state of persistent subacute inflam mation of the airways. 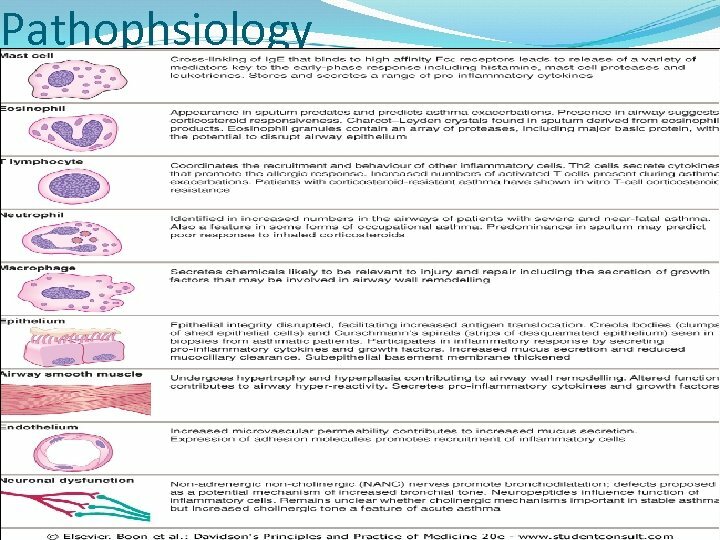 The airways are edematous & infiltrated with eosinophils( which seems to play an important role), neutrophils , & lymphocytes. 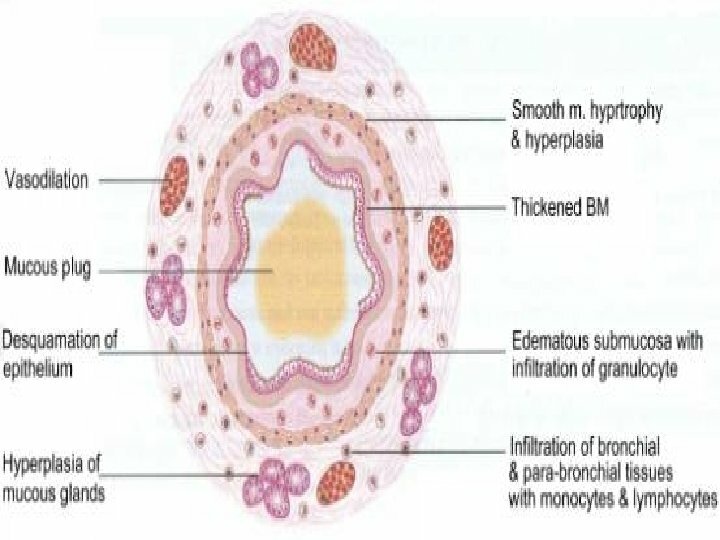 Physiologic & clinical features of asthma derive from an interaction among the resident & infiltrating cells in the airways. 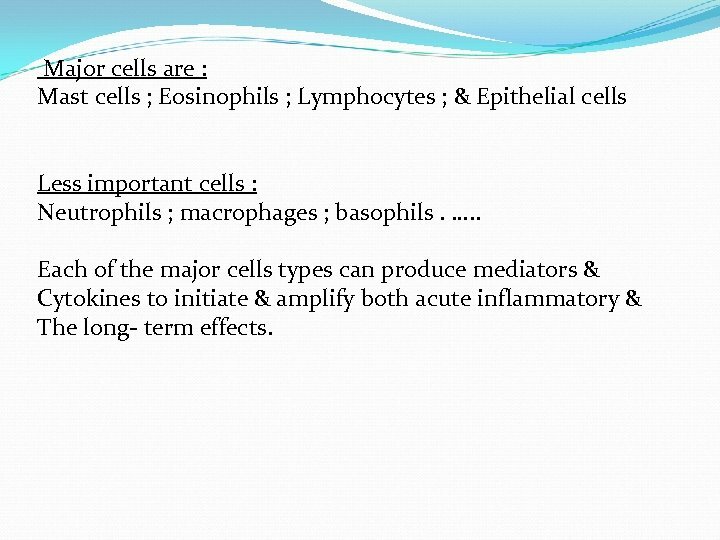 Major cells are : Mast cells ; Eosinophils ; Lymphocytes ; & Epithelial cells Less important cells : Neutrophils ; macrophages ; basophils. 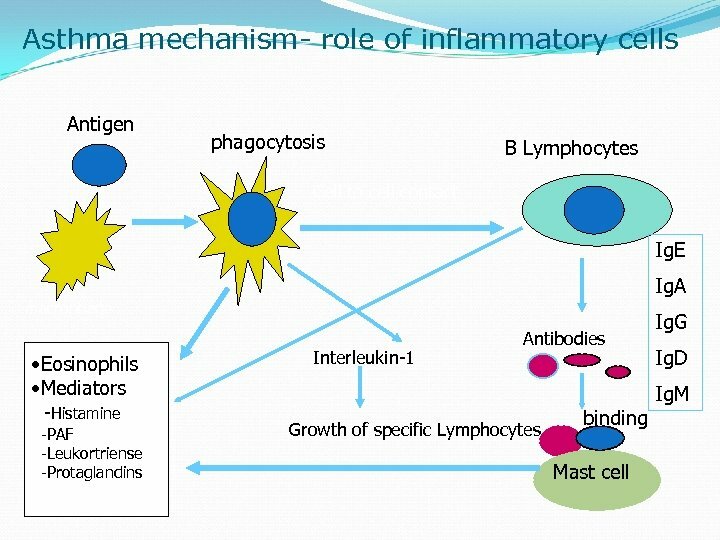 …. . Each of the major cells types can produce mediators & Cytokines to initiate & amplify both acute inflammatory & The long- term effects. 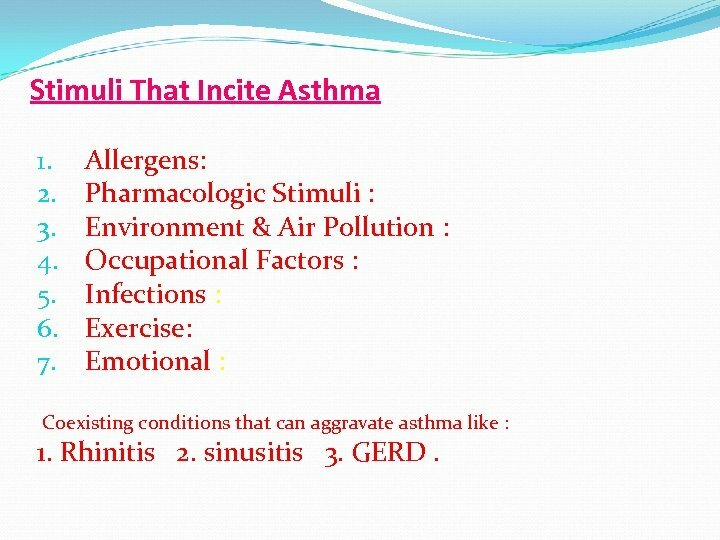 Stimuli That Incite Asthma 1. 2. 3. 4. 5. 6. 7. 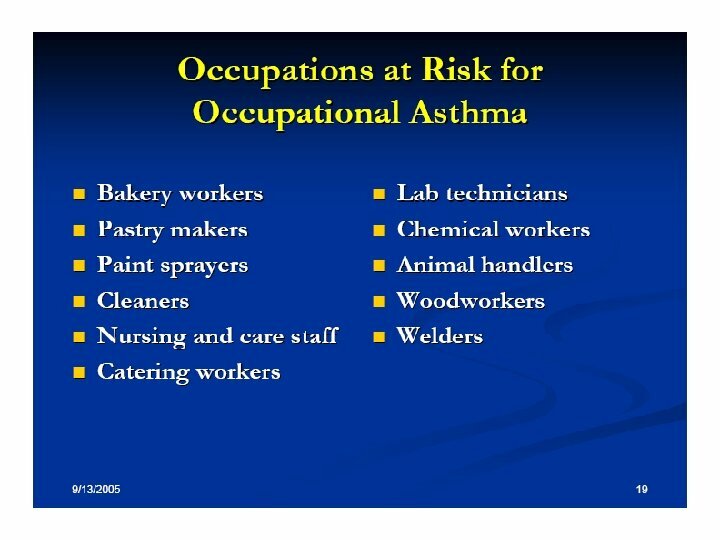 Allergens: Pharmacologic Stimuli : Environment & Air Pollution : Occupational Factors : Infections : Exercise: Emotional : Coexisting conditions that can aggravate asthma like : 1. 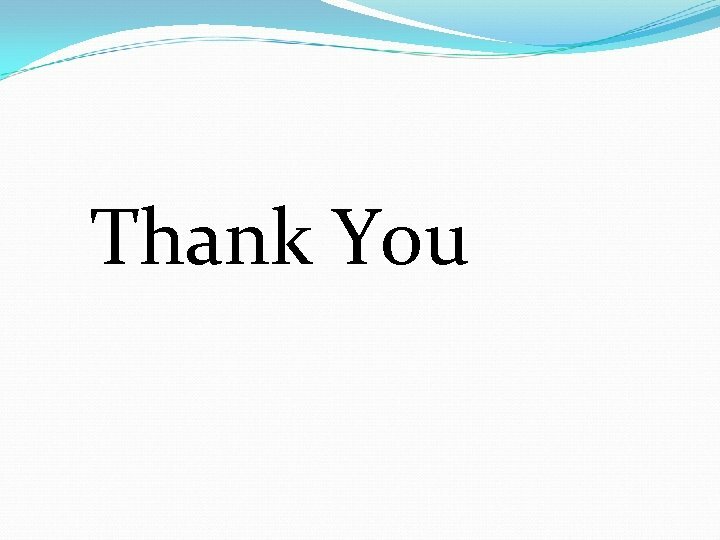 Rhinitis 2. sinusitis 3. GERD. 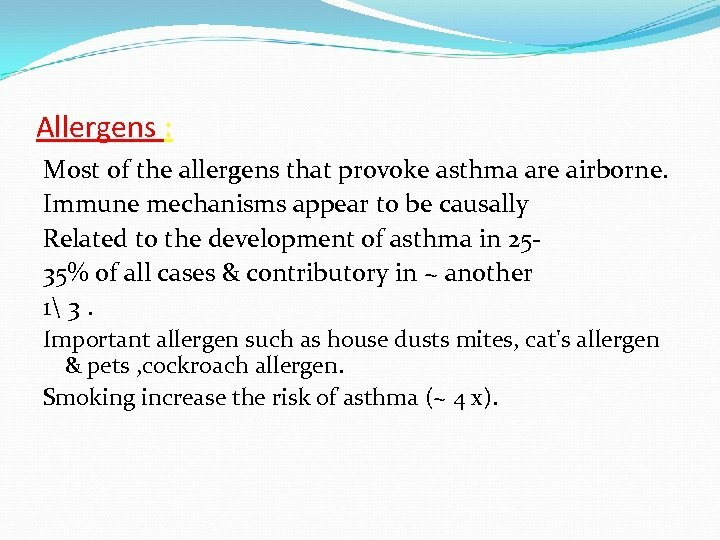 Allergens : Most of the allergens that provoke asthma are airborne. 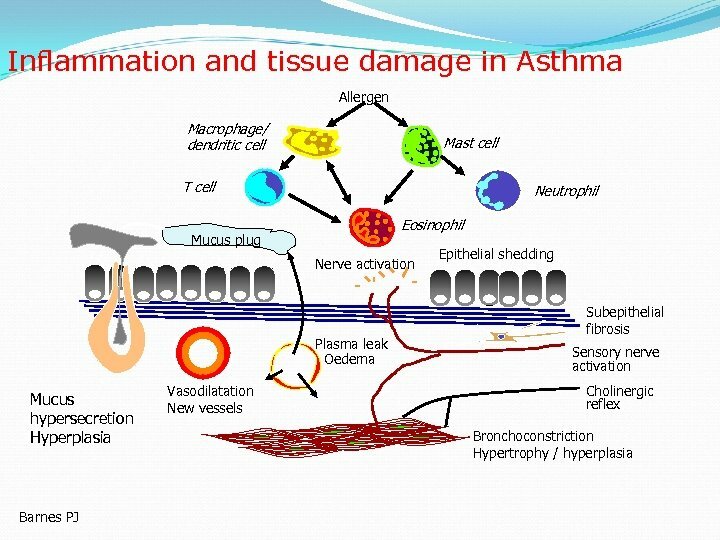 Immune mechanisms appear to be causally Related to the development of asthma in 2535% of all cases & contributory in ~ another 1 3. 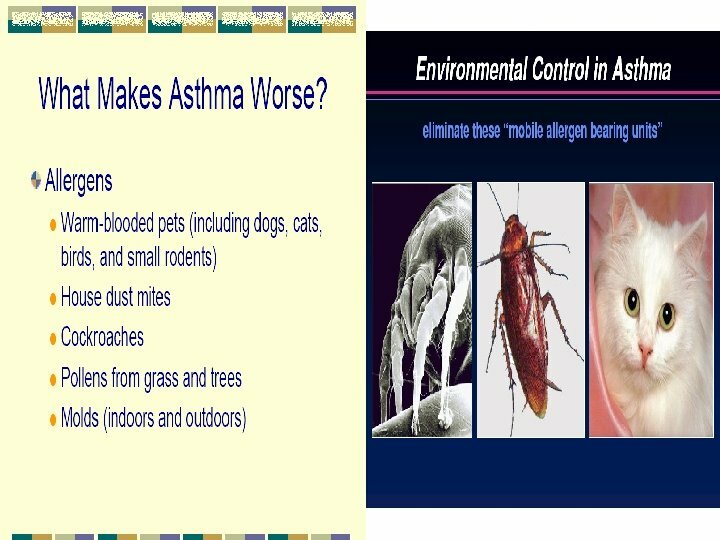 Important allergen such as house dusts mites, cat's allergen & pets , cockroach allergen. 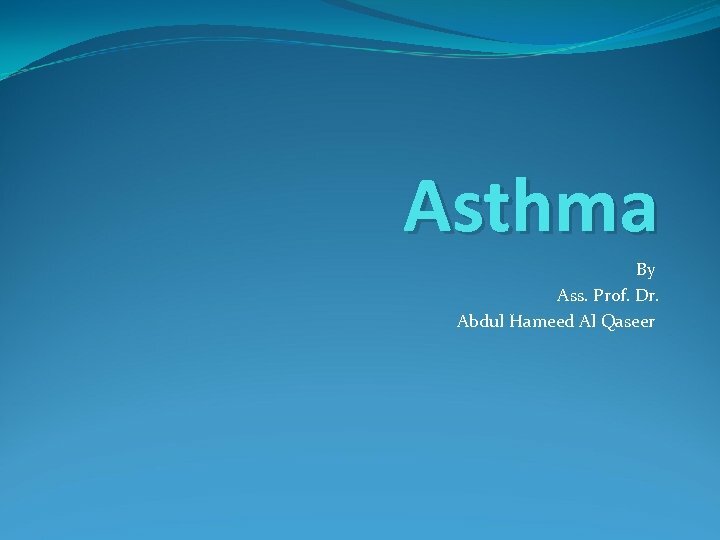 Smoking increase the risk of asthma (~ 4 x). 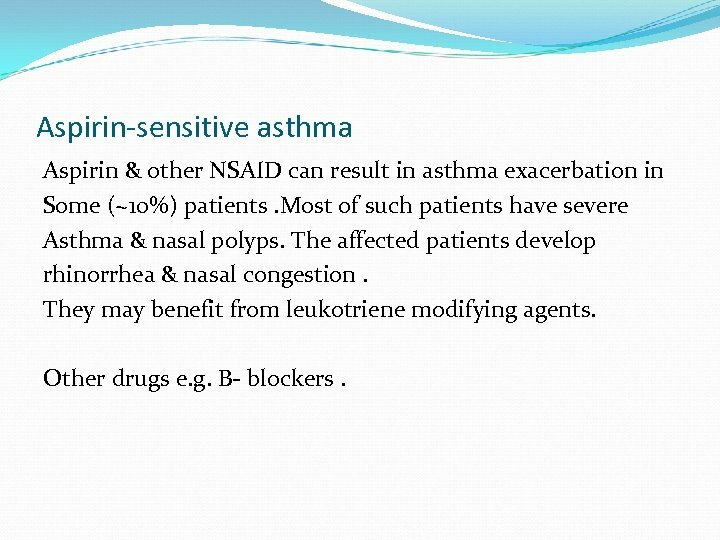 Aspirin-sensitive asthma Aspirin & other NSAID can result in asthma exacerbation in Some (~10%) patients. 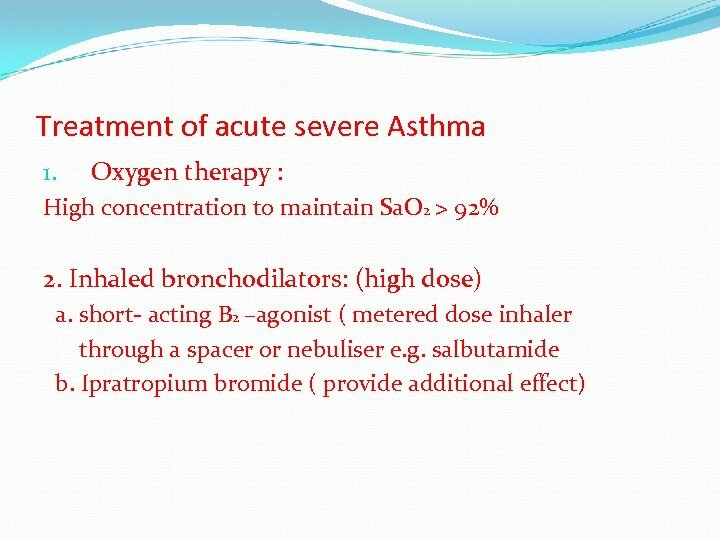 Most of such patients have severe Asthma & nasal polyps. The affected patients develop rhinorrhea & nasal congestion. They may benefit from leukotriene modifying agents. 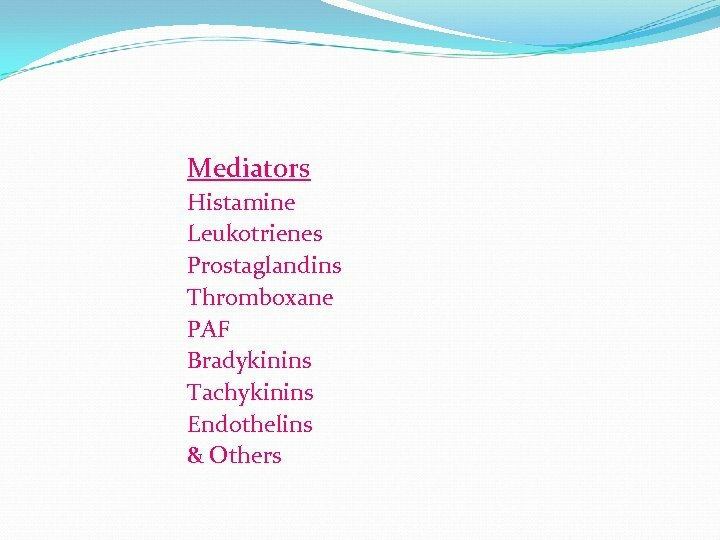 Other drugs e. g. B- blockers. 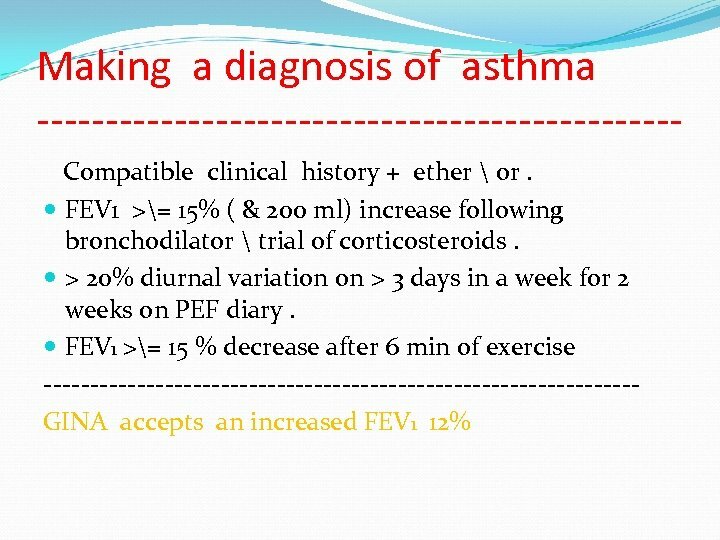 Exercise – induced Asthma Exercise is common precipitant of acute episodes of asthma. Typically the attacks follow exertion & do not occur during it. Short sprints are more likely to induce the episodes. 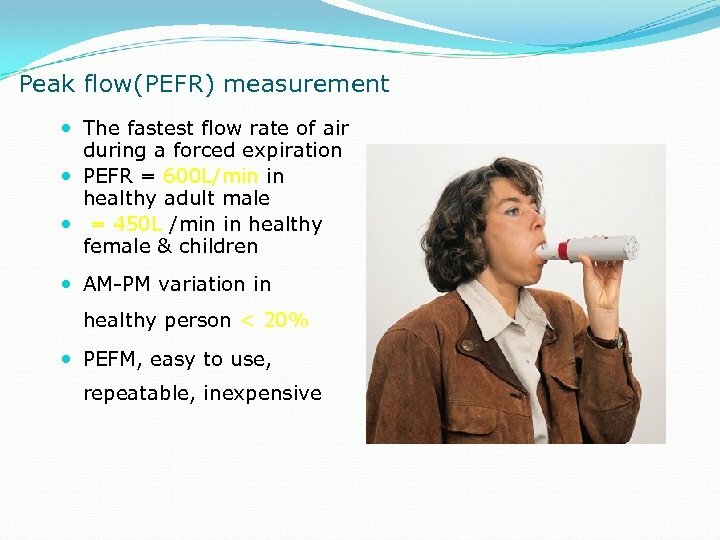 The challenge test consist of a short ( 6 -8 min) exercise , & Spirometry is checked before & at 0, 5, 10, 15, 20, or 30 min. After exercise. A 20% decrease in FEV 1 confirms the Dx. 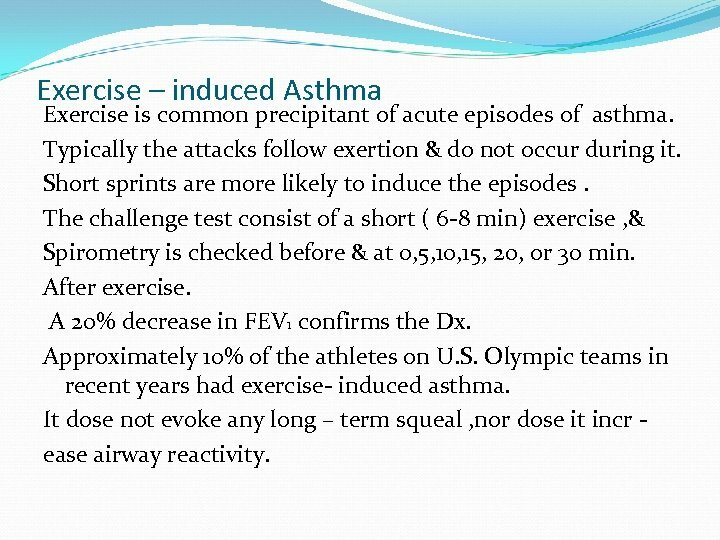 Approximately 10% of the athletes on U. S. Olympic teams in recent years had exercise- induced asthma. 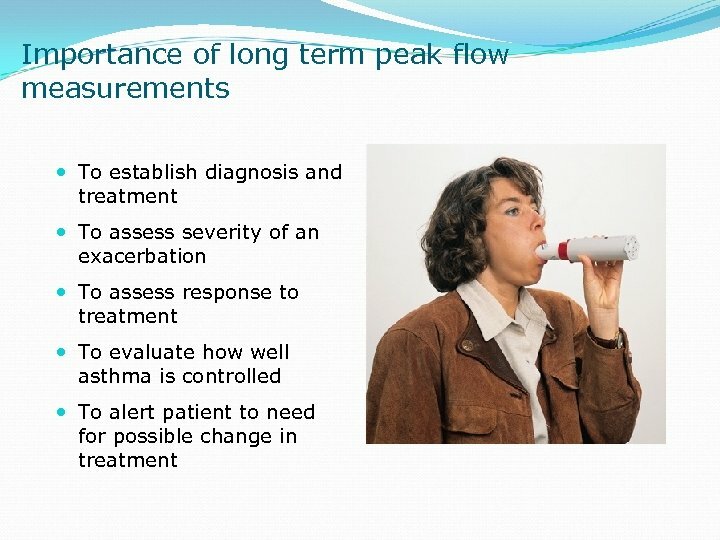 It dose not evoke any long – term squeal , nor dose it incr ease airway reactivity. 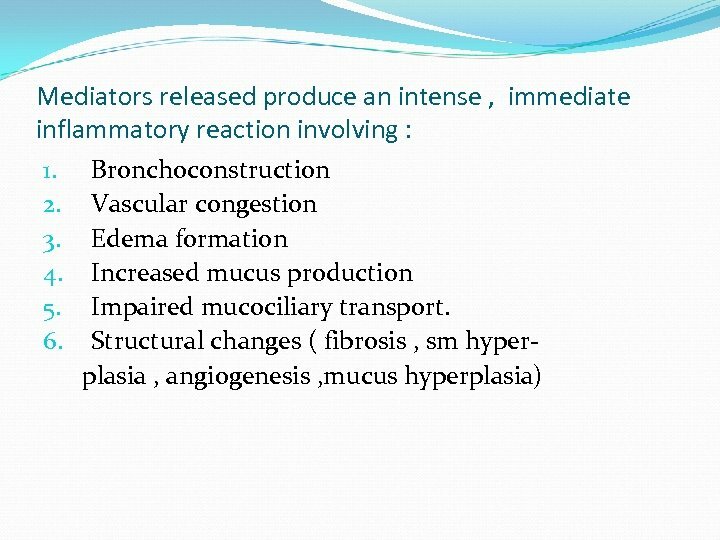 Infections : Respiratory infections are the most common stimuli that evoke acute exacerbations of asthma Viruses & not bacteria are the major stimuli. In children RCV & parainfluenza virus are most important. 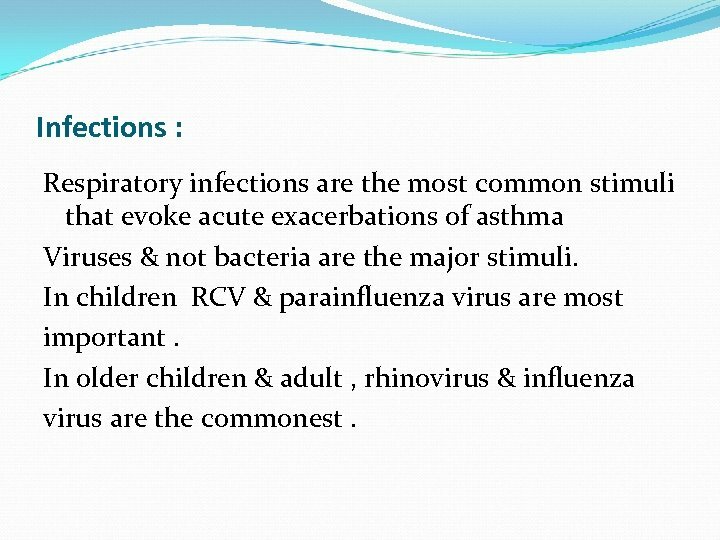 In older children & adult , rhinovirus & influenza virus are the commonest. 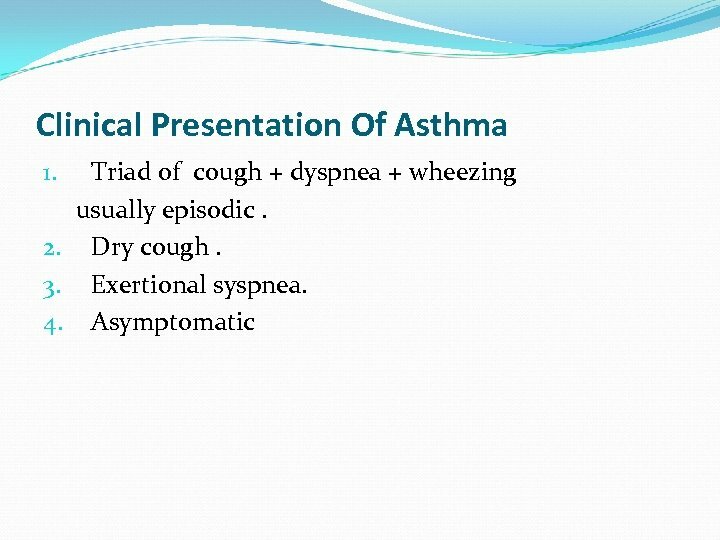 Clinical Presentation Of Asthma Triad of cough + dyspnea + wheezing usually episodic. 2. Dry cough. 3. 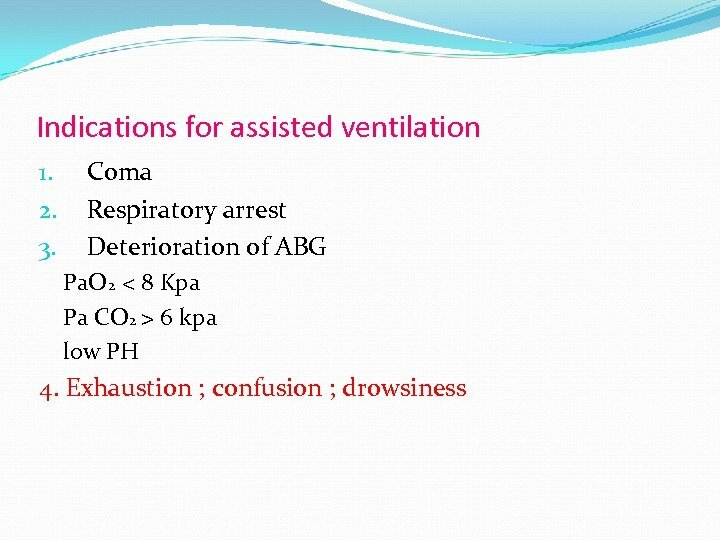 Exertional syspnea. 4. Asymptomatic 1. 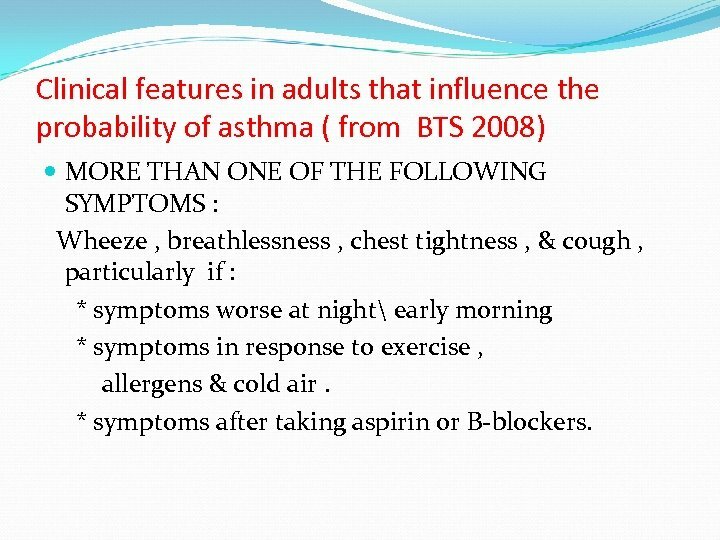 Clinical features in adults that influence the probability of asthma ( from BTS 2008) MORE THAN ONE OF THE FOLLOWING SYMPTOMS : Wheeze , breathlessness , chest tightness , & cough , particularly if : * symptoms worse at night early morning * symptoms in response to exercise , allergens & cold air. * symptoms after taking aspirin or B-blockers. History of atopic disorders. 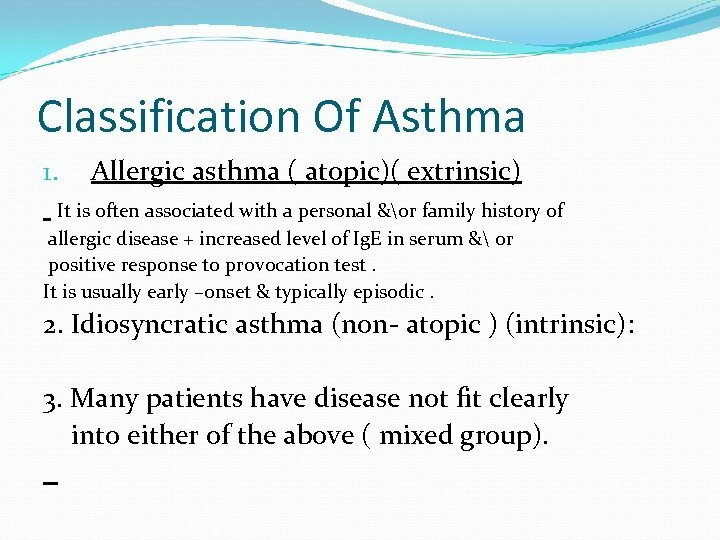 Family history of asthma or atopic disorders. Widespread wheeze on auscultation. Otherwise unexplained low FEV 1 or PEF. Otherwise unexplained peripheral eosinophilia. 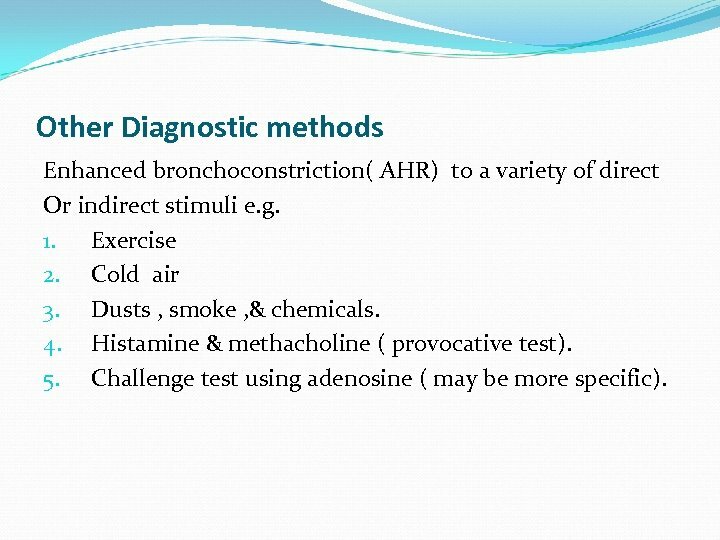 Other Diagnostic methods Enhanced bronchoconstriction( AHR) to a variety of direct Or indirect stimuli e. g. 1. Exercise 2. Cold air 3. Dusts , smoke , & chemicals. 4. Histamine & methacholine ( provocative test). 5. Challenge test using adenosine ( may be more specific). Other investigations: 1. 2. 3. 4. 5. 6. Eosinophilia( sputum or blood) Ig. E ( total or specific). 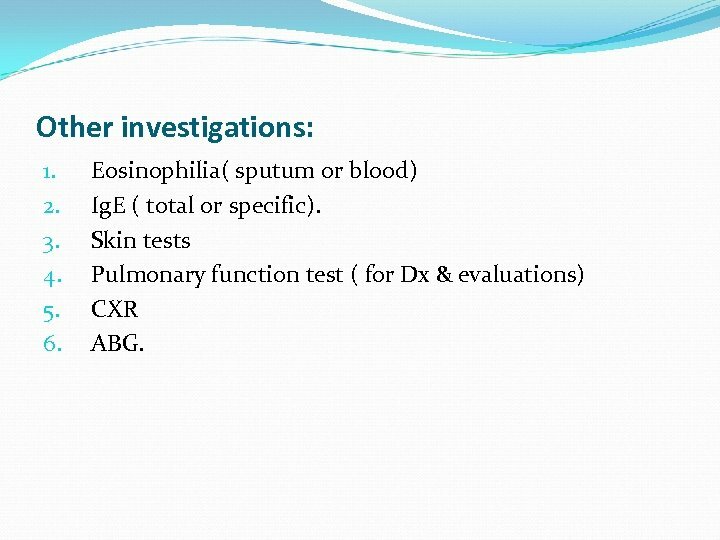 Skin tests Pulmonary function test ( for Dx & evaluations) CXR ABG. D. Dx ( cont. ) Uncommon : 1. 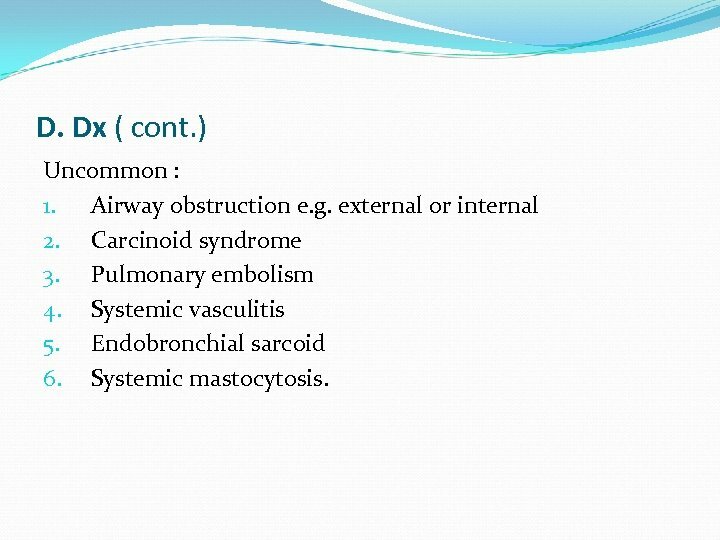 Airway obstruction e. g. external or internal 2. Carcinoid syndrome 3. Pulmonary embolism 4. 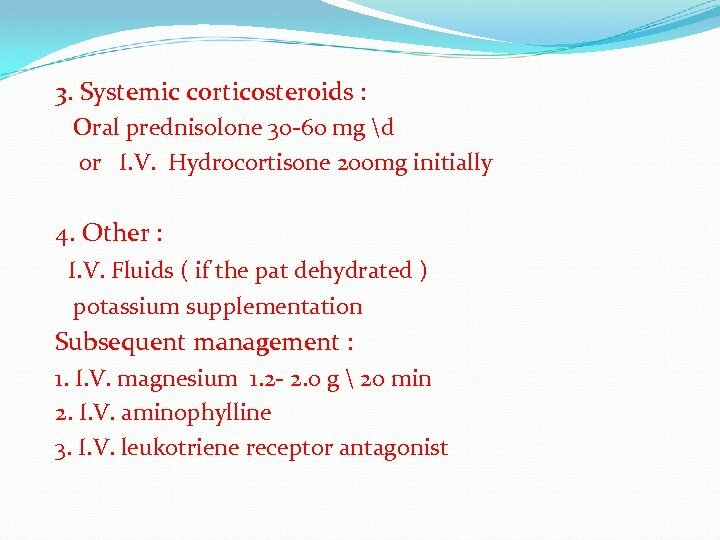 Systemic vasculitis 5. 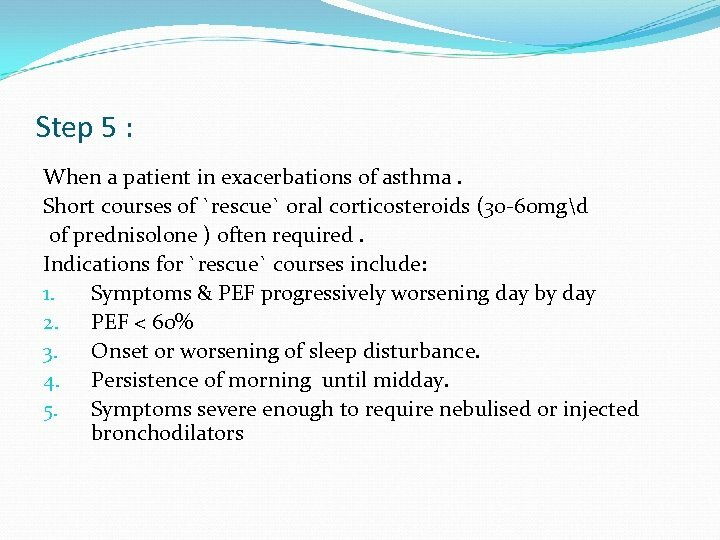 Endobronchial sarcoid 6. Systemic mastocytosis. 2. 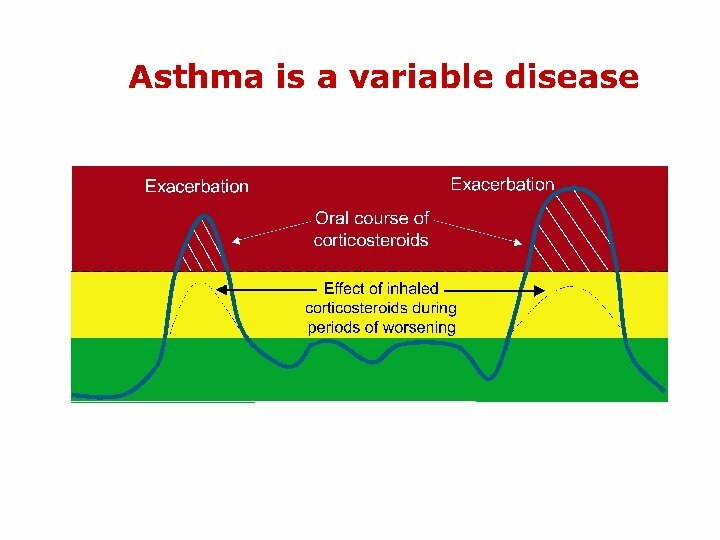 Avoidance of precipitating factors: Desensitization : There is little evidence of its benefit in asthma , & there is attendant risk. 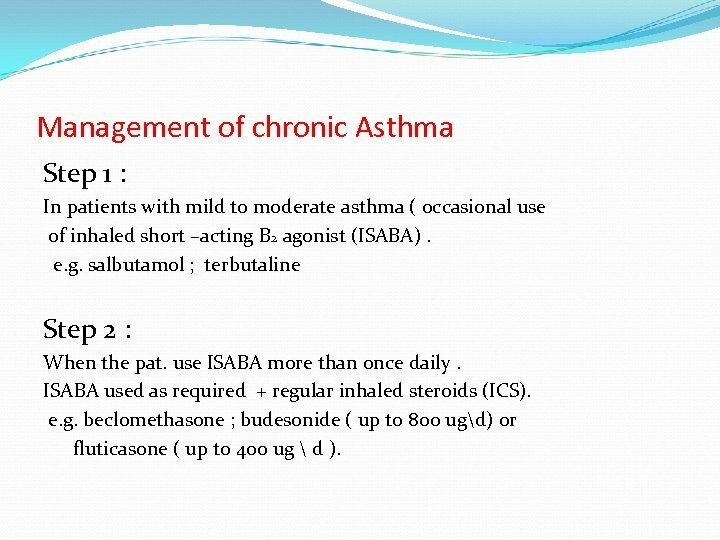 Management of chronic Asthma Step 1 : In patients with mild to moderate asthma ( occasional use of inhaled short –acting B 2 agonist (ISABA). 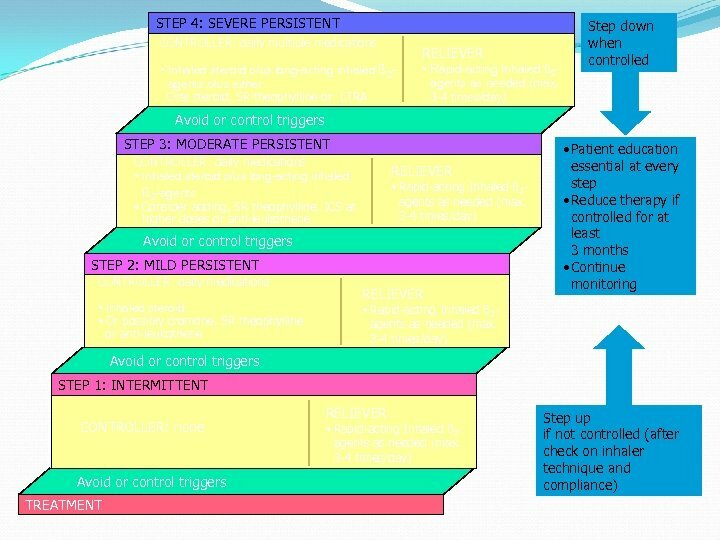 e. g. salbutamol ; terbutaline Step 2 : When the pat. use ISABA more than once daily. 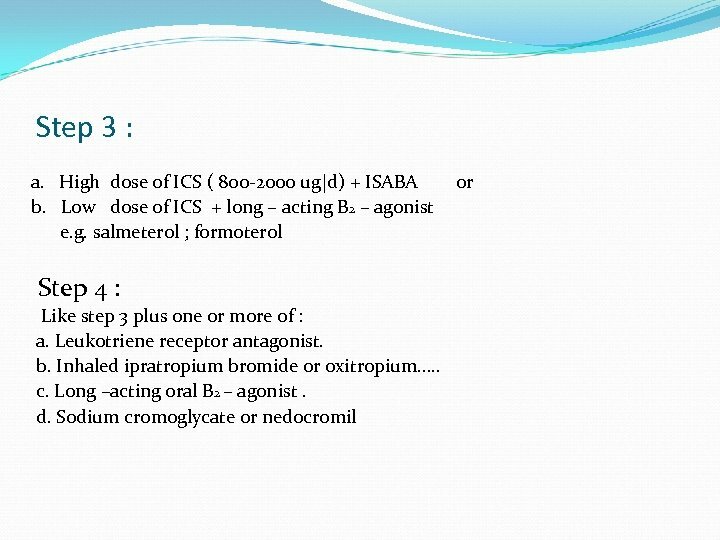 ISABA used as required + regular inhaled steroids (ICS). e. g. beclomethasone ; budesonide ( up to 800 ugd) or fluticasone ( up to 400 ug d ). 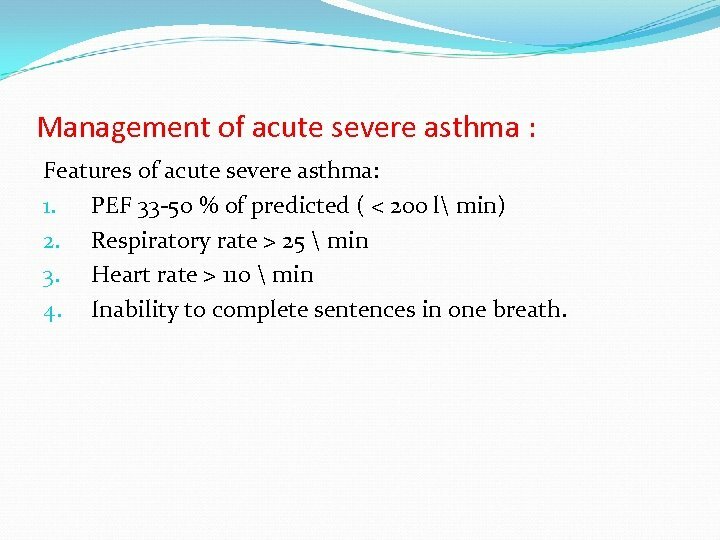 Management of acute severe asthma : Features of acute severe asthma: 1. 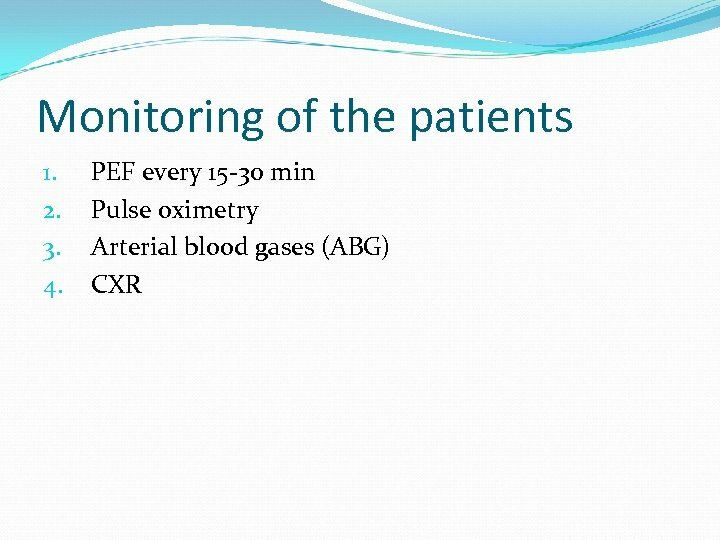 PEF 33 -50 % of predicted ( < 200 l min) 2. 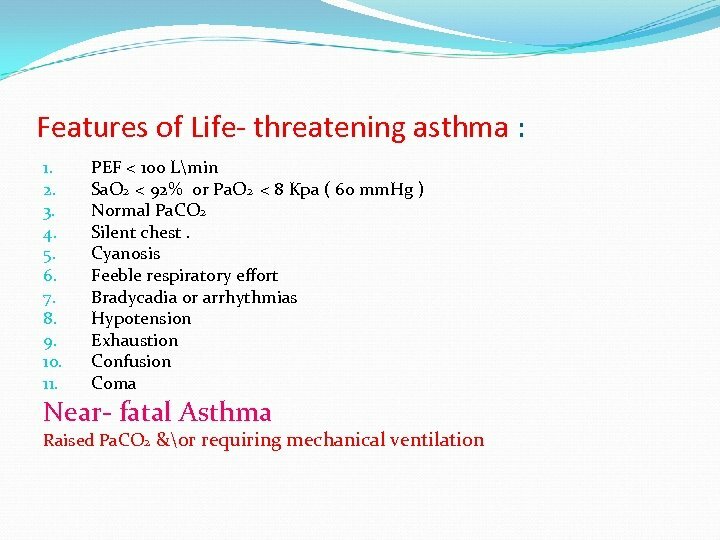 Respiratory rate > 25 min 3. Heart rate > 110 min 4. Inability to complete sentences in one breath.